The University of Mississippi has been awarded $31.7 million to expand the Thad Cochran Research Center, the primary research facility of the School of Pharmacy’s National Center for Natural Products Research (NCNPR). Funding was afforded by several grants from the Health Resources and Services Administration (HRSA) and the U.S. Food and Drug Administration (FDA) totaling $17.8 million, and a competitive National Institutes of Health (NIH) grant of $13.9 million. In the early 1990’s when School of Pharmacy leaders first planned the facilities to house the NCNPR, the concept included two four-story buildings connected by central lobbies. Estimated at a cost of over $70 million, the facility was to be constructed in two stages: Phase-I and Phase-II. Construction of a portion of Phase-I began in 1992 with USDA funds appropriated by Congress. The fertile seed of that initial funding allowed NCNPR research programs to steadily grow while progressively opening doors to additional funding opportunities built on a reputation for advancing the science of developing natural products for pharmaceutical and agricultural commercialization. Phase-I, designed for research involving natural products discovery, included the first research building and the central lobbies. Although personnel occupied the partially completed Phase-I facility in 1995, this 115,000 square foot building was not completed until 2000, following several additional funding awards. The Phase I building includes not only sophisticated laboratories but also auditoria, a science library, a vivarium, and a repository for botanical specimens. A HRSA grant secured by Dean Barbara Wells and Associate Dean Charles Hufford was slated to begin Phase-II (the second research building) in 2010 with a four-story superstructure having but one and one-half floors finished as laboratories. Phase-II was intended for the advancement of natural products toward commercialization. The School of Pharmacy is deeply indebted to Senator Thad Cochran and his staff for their assistance in identifying the HRSA funding. As the time for initiation of construction approached, School of Pharmacy leaders realized another possible funding opportunity when the President signed into law the American Recovery and Reinvestment Act (ARRA). This act included $5 billion to NIH to support funding opportunities to help create American jobs while advancing research. NIH offered these ARRA funds under several programs including one program for the renovation or construction of facilities that support biomedical or behavioral research. Since the design of the entire Phase-II facility had already been completed in order for the HRSA project to proceed, Dr. Larry Walker (P.I. and NCNPR Director) and Dr. Charles Hufford (Co-P.I. ), submitted a grant to NIH in July, 2009 describing how NIH funding, together with the HRSA funding, would allow Phase-II to be completed in a single construction project. Each qualifying institution in the U.S. was allowed up to three proposals to NIH under the program titled Recovery Act Limited Competition: Extramural Research Facilities Improvement Program (C06). No doubt, there was much competition for the limited number of awards. Under the C06 program NIH ultimately made 63 awards across the nation, totaling $675 million. The UM C06 award was the only one awarded in Mississippi, and no other pharmacy school received an award under this program. 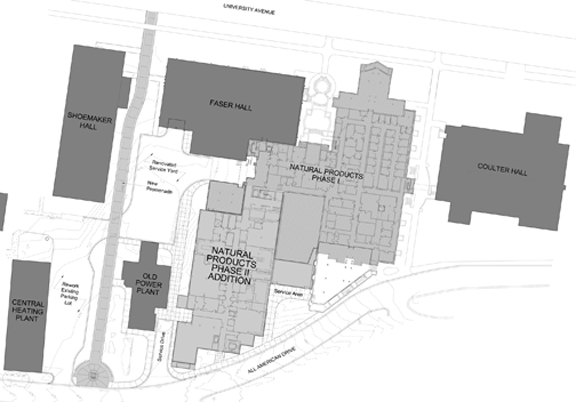 The construction of the 110,000 square foot of Phase-II building, will complete the two-building NCNPR complex, allowing researchers to readily translate basic research of natural products into clinical studies and commercial products. Among the facilities included in Phase-II will be a facility for FDA clinical trials; an expanded repository for botanical specimens; laboratories for scale-up extraction and isolation of bulk natural products; laboratories for scale-up synthesis; Good Laboratory Practice-compliant (GLP) analytical facilities; Good Manufacturing Practice-compliant (GMP) facilities for production of active pharmaceutical ingredients (API); laboratories for formulation and characterization of APIs; laboratories for cellular and molecular mechanism of action and toxicity studies; and laboratories for expansion of discovery efforts for microbial and marine natural products. Designed and engineered by Cook, Douglas, Farr and Lemons (CDFL) of Jackson, MS, the Phase-II plans will now undergo thorough reviews by both HRSA and NIH. Construction is expected to begin in early 2011 and be completed by the summer of 2013.